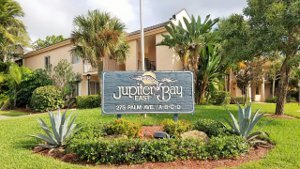 Jupiter Bay condos for sale Jupiter Florida. 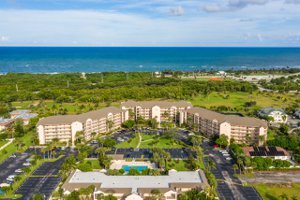 Search all homes for sale in Jupiter Bay condos Jupiter FL with photos, videos, details and including Jupiter Bay Resort condo owners association information. Jupiter Bay homes for sale are located in a well-established community next to Carlin Park. The beaches are just minutes away for residents of these resort-style condos. Outside your windows, you’ll have beautiful views of the lush tropical landscaping, lake or park. 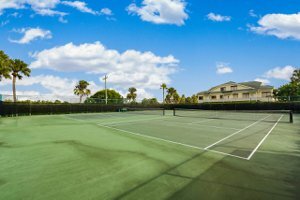 In addition to an array of community amenities, including on-site restaurants (currently under renovations as of October 2018), residents of Jupiter Bay homes also are close to everything the town of Jupiter offers for recreation and entertainment. Real estate in Jupiter Bay consists of 15 buildings with over 350 condos. You can choose from one- and two-bedroom floor plans, which range from 821 square feet to just under 1,350 square feet. To suit every budget and lifestyle need, there are smaller one-bed, one-bath units that are priced affordably without sacrificing the convenience of the community’s amenities. Some of the corner condos in Jupiter Bay real estate have two stories in an upstairs/downstairs townhouse style. Jupiter Bay's maintenance fees cover many of the basic costs associated with home ownership. They pay the cable TV, Internet, water, sewage, trash collection, master insurance, landscaping, pest control, security, fire protection, and property management/maintenance bills. A portion of the fees are set aside and invested as reserve funds for financial protection against the cost of major common replacement items -- concrete restoration, general restoration (pools, lake bridge & waterfall), elevators, building painting, roof replacement, parking lot paving, and irrigation systems. Maintenance fees pay the salaries of a property manager, two office staff employees, and five maintenance employees. 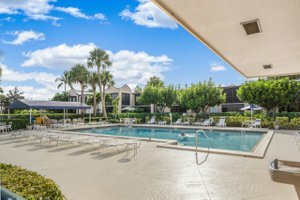 Residents of Jupiter Bay real estate have convenient recreational opportunities just outside their front door. Enjoy heated swimming pools and a hot tub for relaxing after a long day. For a more active afternoon, practice your skills on the tennis courts. Spend time with family and friends at the tiki bar and Beach House Island Bistro. Adjacent to the community is Carlin Park boasting a beachfront view with a playground, bocce courts, paddle boarding, kayaking, fishing, exercise courses, covered picnic areas, sand volleyball, and more. The park’s Heart Trail provides spectacular views for runners and those who want to exercise outdoors. Jupiter’s stunning beaches are a short distance away to soak up the Florida sun while boating, swimming, fishing, or simply lounging on the sand. Shopping and dining near Jupiter Bay homes is easy thanks to the large array of choices. Besides the community’s onsite bistro restaurant and tiki bar, the new Riverwalk area and Harbourside Place have options for menus around the world. Whether you are in the mood for a quick tasty burger and fries at BurgerFi or an upscale dining experience, there is a place for you to try. While you're there don’t forget about indulging in fresh local seafood as well at Tommy Bahama restaurant with an exceptional menu of freshly made daily dining experiences. Feeling a bit more like some spiciness? Check out the incredibly edible opportunities at Calavera's Cantina with amazingly well-crafted dinner entrees, desserts, and cocktails. Find out more Jupiter Town Information Here. If Italian is in your mind with good service and atmosphere to be included, then you can always check out Bravo Italiano. Don't forget The Woods - Tiger Woods first and only restaurant with its casual upscale atmosphere and creative menu items. If you want to find the latest fashions, browse new houseware products, or require specialty services, there is a retailer nearby to suit your needs. Harbourside Place has a number of local and chain boutiques and restaurants. Several shopping plazas and Publix grocery store make it easy to get your errands done quickly. To catch the latest blockbusters in style, Cinepolis luxury cinemas has comfortable reclining leather seats, a full bar, and in-theatre service staff. Traveling to and from Jupiter Bay is simplified by its location between highways US 1 and A1A. Residents of Jupiter Bay are served by the School District of Palm Beach County, which has continually top-ranked programs, including Jupiter High School. For alternative education, there are also private schools nearby.